Why are events in Calendar View overflowing day boxes when printed/print previewed? 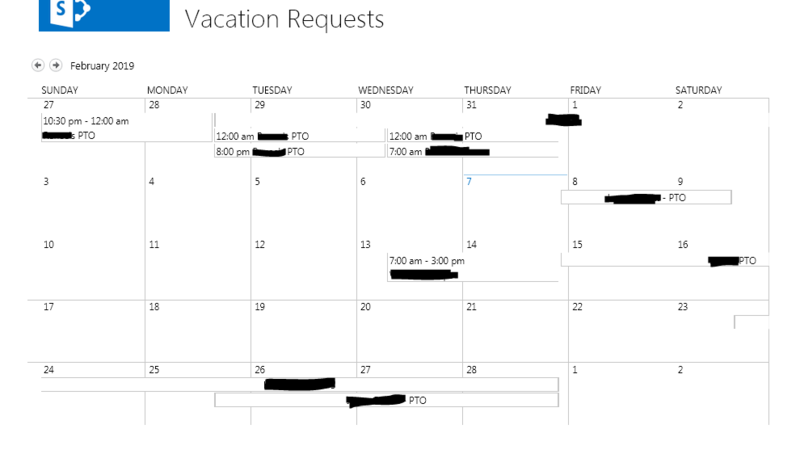 I have an employee whose issue I've verified on my own machine who has recently (last two months or so) noticed that, when she tries to Print or Print Preview the Calendar view of a SharePoint Online list, said Calendar's events are not respecting the boundaries of the 'day' box. I've reproduced this issue on both Firefox 65 and IE11 on both Windows 7 and Windows 10. As you can see, these (mostly) one-day events are showing up as boxes that spill over partially or completely into another day. Why is this happening, and (how) can I fix it? It looks like a CSS issue where the display CSS and the print CSS (SharePoint has both) are out of sync after the most recent SharePoint Online update. These updates are quite frequent, and don't always seem to be fully tested. I would go to your Office 365 Admin Portal and submit a Service Request. Give them as much detail as possible and hopefully they will get it fixed. Not the answer you're looking for? Browse other questions tagged sharepoint-online calendar sharepoint-calendar printing layouts or ask your own question. Why are some recurring events “forgetting” their end date in the calendar list? All Day Events start the day before? How can I create a print function in SharePoint 2010 that resizes the output by a percentage? Break up Calendar view multi-day task bar?